Previous reports have suggested the GrayKey can crack 4-digit passcodes in a matter of hours and 6-digit passcodes in days, but as highlighted by VICE's Motherboard, cracking times for the GrayKey and other similar iPhone unlocking methods can potentially be even faster and 6-digit passcodes no longer offer adequate protection. Matthew Green, assistant professor and cryptographer at John Hopkins Information Security Institute, said this morning on Twitter that with an exploit that disables Apple's passcode-guessing protections, a 4-digit passcode is crackable in 6.5 minutes on average, while a 6-digit passcode can be calculated in 11 hours. It's not clear if the GrayKey can reach the fastest unlocking times outlined by Green, but even at slower unlocking speeds, it only takes days to get into an iPhone with a 6-digit passcode. Comparatively, it takes over a month to crack an iPhone with an 8-digit passcode, or more than 13 years to get into an iPhone with a 10-digit passcode. 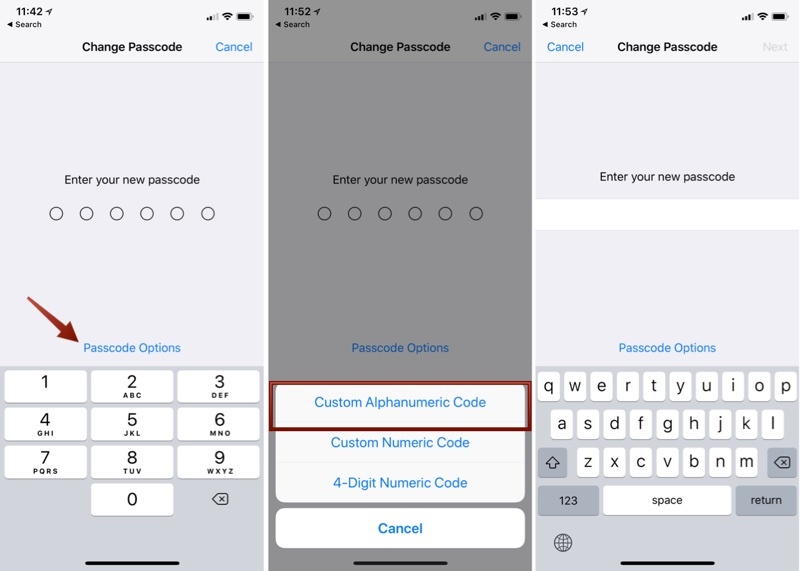 Several security experts who spoke to Motherboard said people should use an alphanumeric passcode that's at least seven characters long and uses numbers, letters, and symbols. "People should use an alphanumeric passcode that isn't susceptible to a dictionary attack and that is at least 7 characters long and has a mix of at least uppercase letters, lowercase letters, and numbers," Ryan Duff, a researcher who's studied iOS and the Director of Cyber Solutions for Point3 Security, told me in an online chat. "Adding symbols is recommended and the more complicated and longer the passcode, the better." To change your iPhone's passcode from a simple numeric 6-digit passcode to something more secure, you'll need to use the Settings app. Go to "Face ID & Passcodes" in the Settings app, enter your current passcode, scroll down, and then choose "Change Passcode." You'll be asked to enter your new passcode on this screen, but you'll actually want to tap on the blue "Passcode Options" text towards the middle of the display. Choose "Custom Alphanumeric Code" to enter a passcode that consists of letters, numbers, and symbols. With an alphanumeric passcode in place, you'll no longer be presented with a numeric keyboard when unlocking your iPhone, and instead, you'll see a full keyboard available to type in your passcode. There's a definite compromise between easy device accessibility and security when using a longer alphanumeric passcode like this. It's a lot easier to type six numbers than it is to type a mixed character alphanumeric passcode into an iOS device, but for complete security, longer and more complex is the way to go. Concerning that they can bypass Apple's "10 strikes and you're out" feature. You mean not everyone is using a memorized 64 character random string? lol. They deserve getting hacked then. Apple: fix this. If I activate a feature that is supposed to wipe out the phone after 10 incorrect password guesses, I expect it to work. No user should be using a numeric only passcode. It should be custom Alphanumeric. Period. Doesn't matter if you're doing something wrong or if you have nothing to hide. Don't be ****ing lazy. Think of the children. It will take them 13 years! If only I could access 1Password from the lock screen. I’d have a 30+ digit, mixed case, alphanumeric passcode. Sigh. Fine. I’m going to pick a random Welsh street sign and add my high school gym locker combination to it. I've seen 25 character mixed case with numbers of special characters cracked in under 20 hours. But keep telling yourself that kind of stuff is impossible if it makes you feel better. Yeah, no. Mixed case with numbers and special characters is drawing from a set of about 70 characters and 70^25 is over 10^46. If you try a billion passwords a second, that still takes over 10^29 years for an exhaustive search, or about 10^19 times the age of the universe. No one is brute-forcing passwords of that length. Now, people are generally crap at picking passwords, so that 25-character password isn't random, and is probably made of a few words with predictable case patterns and character substitutions, substantially reducing that space. However, it's far more likely there's a bug in the code that implements all that, and any crack is taking advantage of that exploit instead of searching for the actual password. Total and utter bull that can be brute forced. And do you know why I know that (other than the mathematical impossibility)? Because anybody with that capability wouldn't be posting here.